Goddamnit, is there anything we can do to speed up this process? We can pretend to not care. Thats why it was so easy to obtain the E.T. prototypes, you know. Unfortunately, the rarest preview carts of a game would take very long to get. Maybe long as the development of Half-Life 3. You see, it's common if an owner has a valuable that nobody else has, the said owner likes to greedily hoard it for the longest amount of time possible. The "hoarders" you speak of are not as common as you might think. These things take time because of the hundreds of other people you have to talk to before you find that one person with a build. And the owners of these carts are real people, with real lives and feelings. You can't just sweep in and make them do what you want. You have to work to their schedule. I've worked some deals for many years before they came to fruition, and it is not for lack of eagerness. This is not like buying something on eBay where someone is a priori willing to sell by the simple fact of selling it on eBay. I wish there was. Unfortunately these things can take weeks, months and years. If there are any updates I will post them. I just spoke to Mr Miteff on the phone. He was the co-creator of Nick Arcade. He remembered the Sonic 1 cartridge specifically, and in fact, this was one of 2 or 3 that they had. They were all under lock and key while at Nick Arcade and were returned to Sega afterwards. Besides, he threw everything away recently anyways. There were no other people who kept anything. It's a shame, "Sonic 1 Nick Arcade" sounded good. edit: by the way, if someone lives near Orlando, FL, and is willing to help out with something Sonic prototype related, please PM me. Oh well. We can't lose what we never had to begin with, I guess. Talking about the title screen, here's a bit more information for you. How can we tell the original didn't look so good? There's footage of the original title screen out there, and from the start we can see it looks barren. Look at how bland that looks below! Obviously it looks better once it's scrolled some more but upon first glance it doesn't look great at all. Also, from what I can gather, those random little chunks in the background weren't always missing. It seems like they messed up the graphics a bit. You can clearly see a part of the rock on the lower pre-release is not broken, but missing in the final. This is so surreal to me. The idea that Nick Arcade got not one, but two Sonic prototypes! I never thought we'd see any more footage of an S1 beta. Whether a cart turns up one day or not, I've really enjoyed seeing this footage. Nice find! Very cool that more secrets like this keep showing up after all these years. Wonder what happened to the cart once it was returned to SEGA - would be a shame if it was wiped and re-programmed or something like that. Damn, I literally just got back from Orlando tonight. I only live a couple of hours away though so if you can't find anyone else closer I could probably help out. Oh hi I'm the one you're looking for. HI SEB LONG TIME NO SEE. Just a heads-up. You people might want to get this book. There's Sonic 1 design documents in it that I don't think have appeared anywhere online before, alongside concept art and interviews with lead Sonic staff (Yuji Naka, Naoto Oshima, Akira Nishino, Kazuyuki Hoshino) and a brief description of four of Sonic 1's levels, as they were originally envisioned. 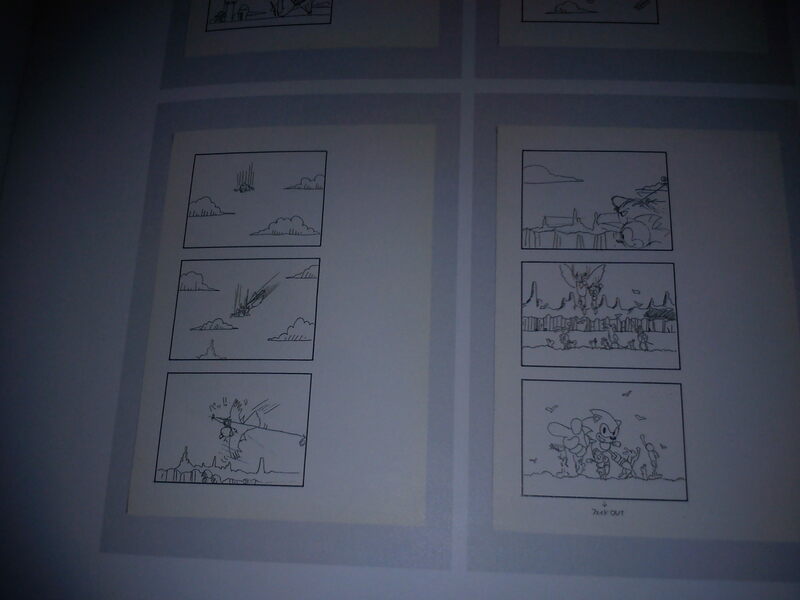 I think the book's great, and I'm really supportive of the people behind it, so I've got no personal interest in devaluing it by putting all the best bits online, but here's a hastily taken photo of Sonic 1's original ending storyboard from the design documents. So, Sonic's band friends were shown during the ending. But if Sonic is falling in the sky... where was he ? Scrap Brain isn't set in the sky, so... Sky Base ? Also, falling pose from CD.